Your Galaxy Tab comes with Google’s own eBook reader app. It has the clever name Books, and it can be found on the Apps Menu. The Books app organizes the books into a library and displays the books for reading on your Galaxy Tab. Begin your reading experience by opening the Books app, found on the Apps Menu. If you’re prompted to turn on Synchronization, touch the Turn On Sync button. The Books app main screen displays your eBook library. The library lists any titles you’ve obtained for your Google Books account. Or, when you’re returning to the Books app after a break, you see the current page of the eBook you were last reading. Scroll through the library by swiping the screen left or right. To begin reading, touch a book to open it. If you don’t see a book in the library, touch the Menu icon button and choose the Refresh command. To ensure that your reading material is always available, touch the Menu icon button and choose the Make Available Offline command. That way, the Galaxy Tab doesn’t have to access the Internet in order to synchronize and download books from the library. Choose that command specifically before you leave on a trip where an Internet signal may not be available (such as in an airplane). If you want only a specific eBook to be available offline, long-press it and choose the Make Available Offline command. To remove a book from the library, long-press the cover and choose the Remove From My eBooks command. There is no confirmation: The book is instantly removed. Synchronization allows you to keep copies of your Google Books on all your Android devices, as well as on the Google Books website. Touch a book in the Books app library to open it. If you’ve opened the book previously, you’re returned to the page you last read. Otherwise, the first page you see is the book’s first page. You turn pages by swiping left or right, but probably mostly left. You can also turn pages by touching the far left or right sides of the screen. The Books app also works in a vertical orientation, though when you turn the Tab that way, only one page is shown at a time. If the onscreen controls disappear, touch the screen to see them again. The Aa button is used to adjust the display. Touching that button displays a palette of options for adjusting the text on the screen and the brightness. 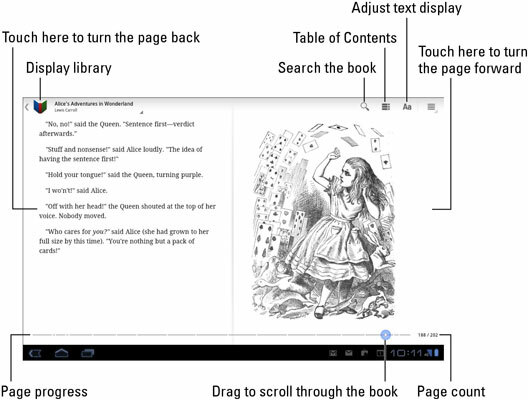 To return to the library, touch the Books button in the upper-left corner of the screen or touch the Back icon button. For the Books app, you obtain new titles — free or paid — from the Android Market, the same place you visit to obtain apps for your Galaxy Tab. 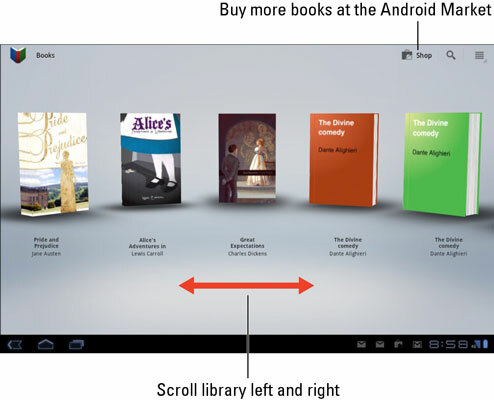 To quickly visit the Android Market’s online bookstore, touch the Shop button on the Book app’s main screen. You can also start the Market app and choose Books from the main screen. Search for books, browse the categories, or use the Search button to locate a specific title, topic, or author. Books with a price button must be purchased using your Google Checkout account. The process is the same as for buying an app. Free books have a Free button. Books you obtain from the Market, free or paid, can be synchronized with any Android device you have where the Books app is installed. Use the Refresh command to synchronize books between your various Android gizmos.